Stories from a SharePoint Engineer who isn't afraid of Visual Studio. You’ve probably tried right clicking around, trying to convert the web part to a dataview web part, and then you threw up your hands and said this is impossible! Ta da! Now you can go about your daily business of form customizations. When i remove the title filed i get Error When i creat a new item? I’ve noticed similar errors also but haven’t had a chance to figure out why. instead, i’ve used custom css to hide the fields i didn’t want instead of deleting it. You”ll probably want to modify the content type for the list and use ShowInDisplayForm (or ShowInEditForm) to toggle the display. Thanks for the tip Oskar, but I’m a bit confused. Where would we be able to find the ShowInDisplayForm property? You mean SharePoint Controls from the menu? Have you tried clicking onto a web part zone on the page before that? sorry..can u explain to me step by step..i want to edit my list..thnx! put your custom list form inside. I have a question regarding hidden fields. Is it possible to have fields (on a SharePoint list form) that are hidden or shown based on the selection made in another drop-down field? Or maybe a hidden sub-form? I’ve been looking for a week for an answer to this all over the web, and I can’t seem to find it. Thanks! Did you got the answer for this? Henry, thanks for the quick answer. Have you seen anything like that out there? If I see it, I may be able to duplicate it. Any thoughts? Thanks again. If this is the case then why not create a new form and import the custom list for into that? 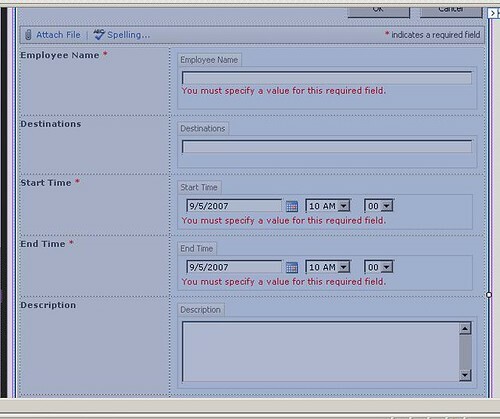 It does the same thing and you dont even have to touch the newform.aspx form. I am having the same issue with the attach button. Does anyone know how to restore the attach functionality in a modified custom form? Hey Sandy, I vaguely remember seeing this fix introduced with SP2. uday, after you have created your custom form, individually format the “read only” form field as “text” or “rich text” instead of as a list form item. is very useful. But one of my design problems thereby becomes not solved. On a wiki-site the option New Item Form is disabled. And just this I need. Is there an other possibility to do this? Thanks. Hey Tobia, I’ve also looked into doing this but haven’t found an easy option to edit wiki new form pages. how do you ‘HIDE” the webpart in sharepoint designer? I have tried the steps listed. However, when I try to insert a custom list, it does nothing. I don’t get an error message or anything. I am trying to edit the newform.aspx. Hey Georgia, are you inserting the custom list into a web part zone? Does anyone have any idea how to layout a radio button group for a Choice field in SharePoint so it displays horizontal rather than vertical. 1.Hide the default List Form Web Part from the page. 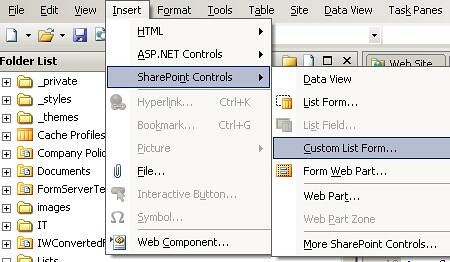 2.Go Insert > SharePoint Controls > Custom List Form. 3.In the List or Document Library Form dialog, select the appropriate list, content type and type of form. I have a strange behavior. When I try to 1-Hide the default List Form Web Part from the page in the small windows I don’t have the control where you can click hide and all the other stuff but I have the page that get display. I try it on an other list and it work but the list I need to change doesn’t. Nothing display in the window with no error but I try the same thing on an other list it work. How can I fix my list to be able to create custom page to add, edit and display my data ? Thanks for this posting. I am using and it does exactly what I wanted and it is easy to do. I have one question someone might be able to help with. I am using this technique to create a custom display form. In my DispForm, I have a field that is a multi-select people field. It is displaying the HTML code instead of rendering it. How do I need to configure that field so it renders the HTML properly? I answered my own question in case anyone else stumbles across this. The display field needs to contain ‘disable-output-escaping=”yes”‘. Enjoyed the site and information you have displayed. I do have one question if I may. Have you had any luck editing the Master pages, such as People and Groups? I want to add more fields to these poeple and groups as well as be able to sort like a list by department? If this cannot be done, then how about I like Active Directory from a list so it can populate the name, department and title and I can pull in pictures of their ugly mugs. What do you think Henry? Any ideas. Also, the trip to Korea blog was most interesting. Never been there myself though. Would like to bike ride across the country perhaps. How come you don’t answer your cell phone anymore? ARe you still alive? I have used the same method for custom list edit & new forms. I have strange problem when I have a column of type spuser with people picker control the check names button does not function. Any info will be helpful!!! I’d like to know how to control the date & time validation on the web? Hey Wong,you can probably use a custom event receiver to check for validation. I’ve created a custom list form. Now I’ve added new fields to the actual list. Anyone know how to go about displaying/adding these new fields to my custom list form? Hey Al, you should be able to add the new fields by dragging it in from the list’s data source. I will be very grateful if you can help me on this one. I have had a look at your guide and i cant get it too work. When i click “Custom List Form”, i then select the list or library i require. When i click okay (to import a new item form) … NOTHING HAPPENS. Sharepoint designer doesnt render anything. I have tried allocating a web part zone, everything. It just seems to ignore the command. -Pick my custom task list and the content type and click OK. But after this, nothing happened. I mean no code(columns of fields)has been inserted. Another strange thing is when I open the default edit form aspx for my custom task list, it only shows three genric columns with names such as Name1, Name2, etc. It is totally different from when I run this edit form from IE or Firefox(in which all the columns shown as I expected). Please let me know why this happened? What might I miss? Iam using custom aspx form(developed in vs.net) in content types for edit/desplay. When i edit the list item the form will open but the form fields are not getting binded. -Form data now displays correctly. -I have to click YES or else it won’t save. -Checked my list in the browser and clicked NEW = Invalid page URL error. Pls help… I’ve recreated this list over 20 times trying different things and it always seems to break. Any help is much appreciated! Soooooo after about 20 tries/rebuilds, I figured out the fix. I’m posting this in hopes I can save someone from ripping their hair out. Before you try this, please save your list as a template with “save content” checked. I’m 99.9% sure this will work for everyone, but I’m not responsible for any data loss! -In Designer, create a copy (or copies) of the forms you’re trying to edit. -Right click on the list in the Folder View > Properties and click on the Supporting Files tab. -Point “New item form” to the copy you’ve edited and saved. btw, another thing came up, I’m trying to rearrange the order of the form, but some of the fields can’t be cut/pasted. Help? Can’t get the new url to stick. No matter what, it points back to the original file!!! Geez..
you have to set “content type specific forms:” to the content type you are using. At least that is what I had to do. Microsoft has made the sharepointdesigner 2007 free to download down. I downloaded it with great hopes, but I gues there is only so much available in this free software. I tried adding custom list form but it is grayed out. No matter how I do it, where I click, it is greyed out. Do you have any idea if this is one thing that is not available in the free software. We have a custom list that we created, the list has several columns but would like to only display a subset of those columns to the user and then the full columns be made available to the list owner. I found a way to hide the columns but it hides them for everyone, is there anyway for a site admin or someone to see the full set of columns even though hidden? I cannot find a way to do this. I guess I do not see the benefit of offering a hidden column if no one can ever access it. Seems like should be able to hide from some but not all. Anyone ever run into this issue? Am I missing the obvious? Any help would be apprecated. PS I am new to the MOSS environment. Will it reflect the columns if i add it newly?? No matter what I do… I can’t change the new list form of the supporting files tab. Even when I change the name it sticks to the new name… freaking dumb. I did what you said, but now it won’t take me to the dispform.aspx page when i try it through the URL. Instead it takes me to the EndUserDispForm.aspx which was my customized page always. How can I fix it so that the browser does not redirect and shows me both pages? Well after searching and trying multiple things I finally got it to work by tweaking the code. I changed the code from true to false for the WebPart. I changed the code from true to false for the WebPart and the web part is now hidden. 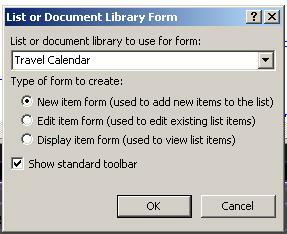 Start SharePoint Designer 2007, and then open the NewForm.aspx page for the list. Right-click the List Form Web Part, and then click Web Part Properties. Expand Layout, click to select the Hidden check box, and then click OK.
You may now easily customize what fields you show or allow for editing with Malcan Worklow for Sharepoint. You decide who, what and when can edit. Check http://malcan.com please. 1. Double-click to edit/open the NewForm.aspx or EditForm.aspx (or whatever). 2. Right-click on the ListFormWebPart (the column 1/2/3 thing). 3. Select ‘Properties’ (this focuses on the Tab Properties tool box pane; only Behavior & Misc show as headers for me). 4. NOW go to “Insert > SharePoint Controls > Custom List Form” and follow original screen shots from there. Hello, you can also check PowerForms which is a silverlight webpart that fully customizes sharepoint forms. You can easily hide columns, change position and a lot other advanced tasks without coding. Give it a try, i think it will solve a lot of problems. I came across this problem today – after being so careful not to touch the default forms as well! 1. I closed down SPD at lunch, came back and carried on working not realising that SPD had opened the NewForm.aspx without me even asking it to – and because they all look so similar I didn’t even realise I was working on it – thought I was working on a copy of the EditForm I had created. 2. Even spookier – decided to leave broken newform as is for now as not a showstopper by any means and carried on trying to work on customising an EditForm copy – when out of the blue I noticed that whenever I created a copy of the EditForm.aspx the list properties automatically set the copy to be the supporting file and not the original. Iwent and checked on the sharepoint site and found sure enough that my list editlink now pointing to the copy file. If I hadn’t noticed it was doing that I could have carried on customising the “live” editform and breaking everything!! This is doing my head in and I can’t find a ref to it anywhere. Do u have any idea how to change focus on share point page. My page contains 2- 3 web parts. But my focus goes to New Item Form web part. Because of this my scrollbar goes automatically down. Please help me to fix this. This problem i face in Internet Explorer only. Please help me to fix this. I have a Sharepoint list with 2 views. There are 8 columns in this list. I want in the FORM fields of the List (where you add a New Item), 2 columns should be hidden in 1st view, and it can be seen in 2nd view. Plz tell me how to do that??? a copy of my driver’s license in with this claim form and hope that the sponsor will contact me directly if there is an issue of me proving I am me. Put in a $15 Blockbuster card, movie sized candy and a bag or two of unpopped microwave popcorn. Surrounded by giant phallus, Lady Bess remains unperturbed as she selectively photographs images for Play Girl magazine. Hey every one! I want to make sure you are coming. Reach the Affiliate Circuit Convention this week and find me to talk company or simply straight marketing. I’m flying in one day early. Due to most of the affiliate marketing conference and Affiliate Marketing Conference sponsors and I really hope to see you there! I'm heading to Microsoft to be a SharePoint Premier Field Engineer!